It was 5:00AM for Nate and I in Colorado as we slept. Most everyone who will read this or follows us was either still sleeping or leisurely starting their Sunday morning without a care in the world. At 6:01AM our lives went on as normal, as planned, but the lives of Heidi Cameron and her three little girls forever changed. The local news made an announcement that a 30 year old male from Sauk Rapids, MN, had been involved in a fatal car crash and it was speculated that “speed was a factor” in the incident. As the world knew, Ross was just a statistic, but what the media didn’t know, what no one but his family and friends knew, was that Ross was a husband, a son, a veteran, and a loving father of three beautiful little girls. So often Nate and I invite ourselves into peoples’ lives for a brief period. We share stories and hugs and we move on, but this was different. We have never invited ourselves into someone’s home, and we have never entered someone’s life while wounds are still so fresh and real. At 27, Heidi is our age. When we were graduating high school, so was Heidi. I try to imagine myself in her shoes at our age and cannot. Heidi invited us into her home where her mother and three little girls sat all looking at these two strange men with a pile of wrapped gifts and one single envelope. It was awkward at first; no one knowing what to say or do. Having dealt with a lifetime of being awkward, Nate stepped up and explained what Project Wildness was and why we were there. We explained that we weren’t there to fix anything because we couldn’t. We weren’t there to tell her everything is going to be alright or to offer words of inspiration. We were there in what could be called the darkest of times to hopefully provide just a glimmer of light if only for a brief second. It was clear Heidi did not know what to expect from us and she certainly didn’t expect what she got; two strangers who genuinely wanted to help, not just talk, but act. Heidi opened up to us about everything. She shared experiences over the days and weeks since the loss. As we talked she shared the story of Ross’s death; not the “news” story, but the true, full story. In 2012 SPC Cameron returned home from war where he received two Purple Hearts for injuries received during his tour. Heidi shared multiple stories with Nate and I including the time a roadside bomb detonated under a Humvee that Ross was a gunner for. He lost hearing in one ear and partially in another while also sustaining a traumatic brain injury. SPC Cameron’s injuries weren’t immediately visible like a lost limb or scar, but they were there. SPC Ross Cameron lost his life as a result of a potential PTSD attack one day before his scheduled appointment with the VA clinic. I can’t tell you whether or not things would be different if that appointment had been 6 months earlier, but Heidi and her family believe they would still have a husband, a son, and a father if the help had arrived earlier. We aren’t here to place blame or point fingers and I truly believe the VA clinic was doing all they could with the resources they had at the time, but perhaps that is the point. Our soldiers, our family, our neighbors, and our friends need just as much support and attention when they return home as they had while away from home. Nate and I sat and listened as the story of Ross’s death unfolded and we will be the first to admit not every tear could be held back. Heidi also shared stories from after the accident that were hard to handle including some negative comments from a small group of individuals hiding behind the detachment only the internet can provide. Heidi’s three little girls, Caylee (5), Lily (4), and Mayzee (1), sat calmly on the couch as their mom opened up to two complete strangers and, at times, came over to comfort their mother with a quick hug or tissue. I was incredibly impressed by their patience as a mountain of presents sat right in front of them. I think I was more anxious for them to rip into the gifts than they were and eventually I just gave in and started handing them out. It was Christmas in late June as wrapping paper flew through the air followed by screams of pure joy and ecstasy. I can’t imagine what the girls have gone through in the last 3 weeks, but for the brief moment it took them to ravage a mountain of gifts they were smiling and nothing else filled their thoughts but simple happiness. I looked over at Heidi during the party and she had water in her eyes, but this time I think they were tears of joy instead of sorrow. Shortly after the excitement died down and the girls shifted their attention to their new toys Nate and I said our final goodbyes. Several hugs were shared and we left, but with the heavy feeling that we wanted to do more. “How can we do more?” I thought to myself. Heidi and her family are anything but a charity case. Heidi expressed her concerns about paying bills and funeral expenses that the VA failed to cover. Her answer was that she had to work more or get a second job. She would make it work for the girls. Time and time again through her stories Heidi would say that this is too much to handle, but then she would go on to handle it. After Heidi told us that she wanted to work with other families dealing with PTSD to get them the help they need Nate said, “Heidi, I think that right there shows you how strong you really are.” Nate didn’t tell Heidi to be strong or that things will “get better”. Instead, Nate pointed out that Heidi was already strong as she led her family and herself through the tragedy. Heidi has repeatedly expressed her distaste for the title of “widow” and rightfully so. It is a cold word clothed in black that begs people to show pity. She does not need pity nor does she want it. Heidi is not a widow; she is a mother, a daughter, a sister, a friend, a co-worker, a neighbor, and most of all a human. Heidi is one of us and I refuse to ignore her during a very dark hour. To Vanessa S… Your support for Project Wildness has meant more to us than you will ever know. You jumped on board very early in our journey and lifted us up immediately by sharing our cause and donating with a very specific request; “If you find a mom who looks overwhelmed, please brighten her day up in some way…” We found that mother. Every day you work tirelessly whether it is at the plant, at home, or getting your bachelor’s degree. 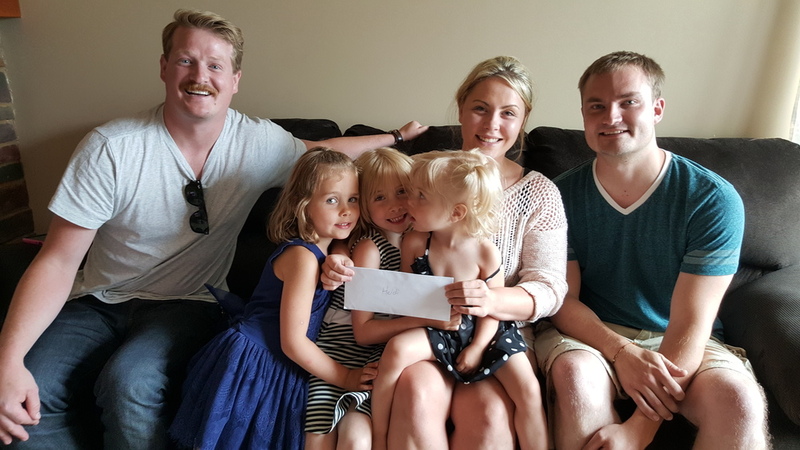 When asked how you do it all, you simply say, “It is for my family.” Your donation went to brighten the day of an overwhelmed, but not beaten, mother in recognition of all she does. We also want to recognize you for everything you do for your family, coworkers, and friends. You are a true inspiration to Project Wildness! To Jen D… You gave with the hope we could find a mother who could use a hand. We found her. Her name is Heidi and she lives in Sauk Rapids, MN -- so close to home. She shares in the everyday challenges of every mother, but now has the added responsibility of raising three beautiful little girls on her own. What you did for this family was selfless. You touched broken hearts when they needed it the most. Your compassion initially showed in the form of a donation but now extends to the hearts of four beautiful ladies. A deep thanks to you from all of them. To Lindsey R… You’re a mother who can no doubt understand how difficult that role can be at times. You’re also a mother who no doubt understands how beautiful it is to hold that title. When you gave to this project, you had no idea whose life you would touch. Despite that, you gave without judgment or skepticism, knowing that what you had could help someone else. Today, you touched the lives of those who face what few can even imagine. I know you understand the beauty and blessings your own family brings to you each day. You have three bright and smiling faces worshiping you just like Heidi does. Alongside you is someone you can count on in the many challenges that parenthood brings. Cherish them in all you do. From the bottom of our hearts: Thank you for sharing your family’s light with this family as they walk through such a dark time. To Brad and Shelly… I will never forget the sincere joy and elation you shared with me when I told you of the plans we had for Project Wildness. Your eyes lit up, and I knew you understood something I think only we could in the beginning. You got it. You didn’t question why or how, but instead immediately believed in the ability for such an idea to do good in this world. The two of you are an inspiration. You approached me with your trust and shared money in the hope that it could help children along the way. Those children’s names are Caylee, Lily, and Mayzee, and what you did for them and their mother cannot be done full justice in these words. From us and a family who needed you: Thank you. To David G… We had no idea in the beginning where we would use such a generous donation. I can’t deny that responsibility involved a little anxiety and a fair sense of pressure on our side. We wanted to do justice to what you gave. We wanted it to mean something to you and most of all to whomever received it. Today, we promise you that through the tears of a great mother and the smiles of three amazing little girls, your donation lived up to everything it could be. It could help defray some of the costs of a funeral and other financial responsibilities for the family of a father who defended the safety and security of not only his family, but our own as well. We cannot thank you enough for what you have done to help this cause. And the words of Heidi said it best: “Be sure to thank all of the people who helped do this.” That’s you, David. Thank you.